Forum member raiden225005 informed us that these have hit Toys “R” Us store shelves as well. Read on to check out images and additional info for each set. You can see the photos by reading on. Read on to check out he images. 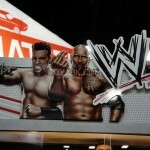 Here are some photos of Mattel’s WWE Display from SDCC 2013. 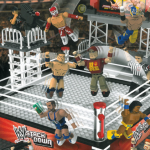 Check out the WWE toys on display at San Diego Comic-Con 2012. New figures that made their debut at SDCC include WWE Elite Brock Lesnar and WWE Legends Mankind! A new version of The Rock with his current tattoos is shown as well, check them out after the jump! In and out of package photos can be seen by clicking the headline of the story.